The tool defines a marker that inherits from the platform's text marker and task marker. It also defines named attributes for the marker. Marker attributes can be set and queried. Since the new readme marker is a kind of text marker, it inherits the text marker attributes. The text marker attributes include the character location of the marker. 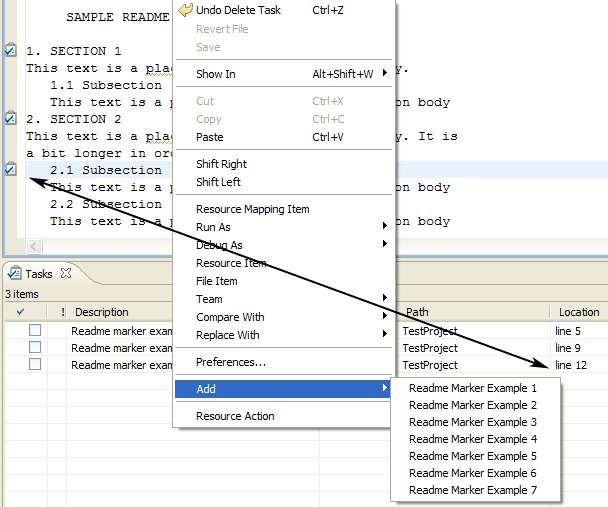 Markers can be added to a .readme file using the readme editor's popup menu. (The popup menu actions are added dynamically in ReadmeTextEditor.editorContextMenuAboutToShow(IMenuManager parentMenu)). Once added, the markers appear on the left side of the editor and in the tasks view.